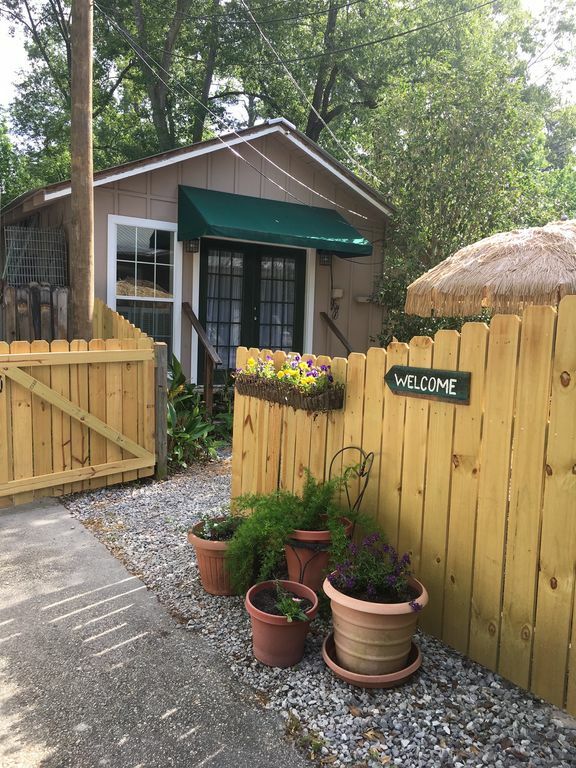 Quaint private apartment in the heart of Mandeville offers a quiet retreat. Have the best of both worlds. Newly renovated 850 sf apartment offers a quiet peaceful retreat in the heart of Mandeville but only an hour drive to the bustling French Quarter! One bedroom apartment is perfect for a weekend get away. Located close to the Tammany Trace, we offer two dedicated mountain bikes to renters to explore the beautiful northshore. We are located 10 blocks from the shore of Lake Pontchartrain. Complimentary coffee service and continental breakfast included. Explore Fountainbleu State Park, enjoy the fabulous restaurants and bars in Old Mandeville, or listen to live music at nearby Rubies Roadhouse (Friday and Saturday nights only). Guests will also enjoy the peace and quiet of the property. Full kitchen except for no stove but we do have a microwave and toaster oven. Bathroom has tub and shower. We have two labradors on the property. They are fenced separately and won't be in direct contact, but they are on site. 2019 Update: There is a house being built next door. They do not work on the weekend only weekdays. Just giving full disclosure! It is on the far side from the guest house. full kitchen except no stove. only microwave and toaster oven. We really enjoyed our stay here! The place was super clean and had all the conveniences we needed. Bed was so comfy! Located on a quiet street but near all Mandeville has to offer. Very nice host! Would stay there again! This apartment was perfect and very clean. The owners were very easy to work with and even though we didn't get a chance to talk much, we communicated through text very easily. This apartment is in a quiet neighborhood and is a good getaway if you are looking for a place just to relax. There is a small courtyard for outside sitting. Very comfortable apartment. I would definitely stay here again. Nice farmer's market in town on Saturdays thats worth a visit. Nice and Quiet place to stay! Owners were very knowledgeable about places to eat and things to do. My friend and I rented the cabin for 4 nights and had a great time. The cottage is very comfortable and felt just like home. I slept on the magnificent bed, and my friend slept on the couch. We used it as a base camp to explore the North Shore primarily by bike and primarily on the Tammany Trace (which is so much fun!). Mandeville also has so much to offer including live music at the Dew Drop (big thank you to the VRBO owners for recommending that fun), a tour of a historic home, Saturday Farmers Market, waterfront, etc etc. We can't wait to come back and will definitely rent this sweet spot again. The apartment was very clean, well decorated and very quite. The tin roof was great during the rain could have slept all day. The owners were very nice and very helpful in selecting great restaurants.